Education is the foundation of holistic human development and advancement of all. It is a continuous challenge. Learning throughout life enables people to improve their living conditions and contribute to the development of the community and the country. The SEKEM School was founded in 1989. It is situated near Bilbeis, about 60 km. northeast of Cairo, on the premises of SEKEM. The pupils represent all social levels and come mainly from the nearby town of Bilbeis or the surrounding rural neighborhoods. The school serves Muslim and Christian children alike, encouraging them to live in harmony and have respect for the other’s religious practices. 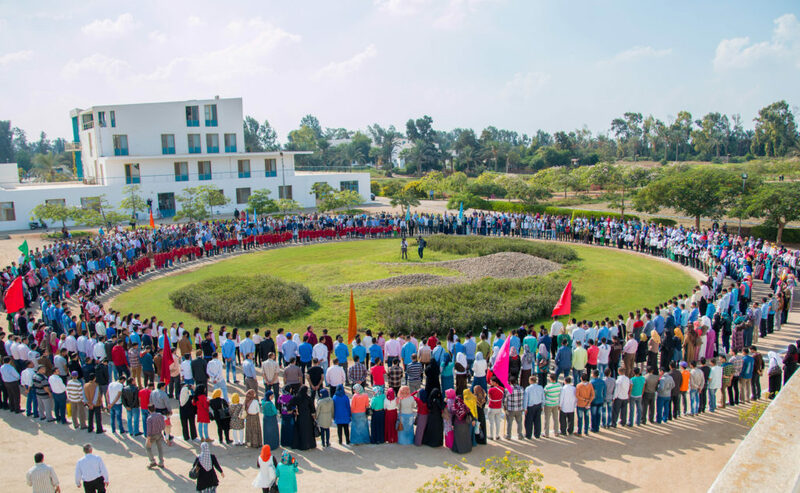 Although the SEKEM School is approved by the Egyptian Ministry of Education and is based on the Egyptian State Curriculum, it also promotes new forms of educational and social interaction. Besides focusing on improving pupils’ knowledge and skills, the SEKEM School also emphasizes programs which cultivate the integrity and character of the individual. Thus conventional education is enriched with courses in eurythmy, crafts, drama, dance or music. By combining traditional educational methods with innovative learning experiences, it is possible to foster the maximum social, cultural and educational development of each child. Working and learning are interrelated and are both practiced at all age levels. For this, the SEKEM School provides spacious and well equipped facilities, including workshops and a theatre.